Body Fat. We all want to burn it off and send it packing. Not that body fat doesn’t have its place but in excess it clogs things up, squeezes important organs and pretty much gives us an express ticket to low self confidence, illness and at worst an early out from this world to the next. Of course, not all body fat is bad and is, in fact, a natural and ESSENTIAL element to our physiology. Which, of course, brings us to body fat percentage- that mystical number where sub 12% for guys and 20-ish% for the ladies gets you to “Hey… I look like that Guy/Girl in that magazine” land. Still, unless you’ve got a reference… numbers are just numbers. 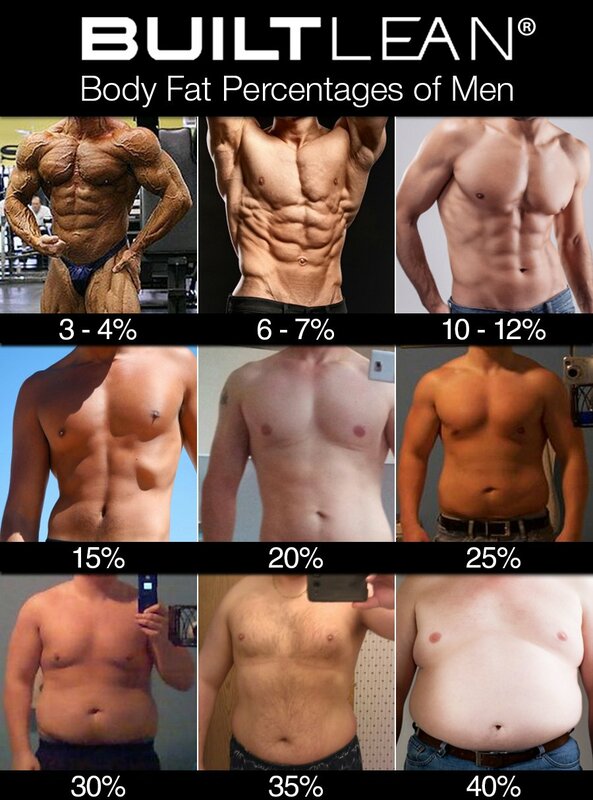 Percentages can be a little tough to visualize- you’re not alone if you’ve ever wondered what an ideal body fat percentage looks like. Body Fat- is the amount of body fat divided by the total body weight (IE- everything else that isn’t fat- bone, muscle, organs, etc.) which is then listed as a percentage. For example: if a man weighs 190 lbs and has a total of 20 lbs of body fat, his body fat percentage (BF%) is 10.5 percent. One thing to consider is that body fat doesn’t show up or disappear in the same place on every body. Using our Styku Body Scan, you can determine exactly where those measurements fall as well as how much body fat percentage you’re actually carrying. Keep in mind- as individuals, we’ve all got different body types and genetics where fat collects and deposits where it may. You can thank your ancestors for that one. Generally, however, women’s body fat generally hangs out more in their thigh and buttocks region and men’s body fat sets up shop more in their gut or stomach region. So back to our point: what do these percentages actually look like on a real person instead of charts and graphs and spreadsheets? Luckily, the site BuiltLean has taken time to build some great visuals to reference, which we’re borrowing here to illustrate with full credit. 3-4% body fat: Ridiculously lean. Many bodybuilders drop to a body fat percentage of about 3-4% when they are preparing for competitions. At this level of body fat, the muscles, veins, and striations (the rod looking stripes on a muscle) are very visible. This is a very low level and the lowest level of body fat you should have. Two percent body fat is the barest essential minimum needed for organs to properly function. 6-7% body fat: This level isn’t as extreme as the competition bodybuilder level. However, this level is still very difficult to maintain and not easily sustainable. This level is characterized by muscle definition in most muscle groups and some clear vascularity (the showing of your veins) in areas such as arms, legs, and abs. 10-12% body fat: This level of body fat is a sustainable level for men. Your abs can be seen, but aren’t as chiseled or defined as a man with 6-7% body fat. This is the body fat percentage that is the perfect beach body most people strive for. At this level there is still some defined veins in the arms and legs, but not as visible as less percentages. 15% body fat: This percentage of body fat usually fits into the “lean and fit” category. Outlines of muscle can be seen, but there is not really a clear separation between them. Muscles and veins can slightly be seen, but are covered by a thin layer of fat. However, the overall body shape is present and can be noticed. 20% body fat: Muscle definition is not as present and noticeable especially in the abdomen. A man with this level of body fat typically has the “soft” look and has a pouch on his abdomen. 25% body fat: There is almost no separation of muscles, no noticeable veins and no muscle striations. The man’s waist begins to increase and he may have a little neck fat. However, this man may not look like he has 25% body fat in normal clothing BUT… over 25% body fat for a man is considered obese, and men are creeping into the over a 40 inch waist, which is considered abdominal obesity. 30% body fat: More fat is present around the body at the 30% level including waist, back, thighs, and calves. The waist will appear slightly larger relative to the hips, and the man’s stomach will most-likely be protruding noticeably over the waist. 35% body fat: As men get heavier, their fat tends to go right to their stomach or gut. This percentage of body fat is more of the beer gut look. The waist circumference at this point can be about 40+ inches. 40% body fat: This percentage is very similar to the 35% level, yet there is more fat accumulation in the stomach and waist region. This is the point where basic daily activities become difficult such as walking up stairs or bending over to pick something up. At this body fat percentage you are considered morbidly obese. 10-12% Body fat: This percentage is the lowest a woman should be. At this percentage the women’s vascularity and striations are visible. However, the striations are not as clearly visible. The woman’s muscles are clearly separated. At this point, you may be wondering why women’s body fat is higher than a man’s. The reason is because women have more fat in beat tissues and surrounding the uterus. This level of body fat isn’t necessarily considered safe or healthy for women who menstruate. 15-17% body fat: At this level muscles are still visible. Abs, legs, and arms have definition. There is some separation between muscles there is also some vascularity. Women don’t have as much curvature in hips and buttocks because of the low body fat level. This is a common level of body fat among fitness models. Many women who are at this level may not be able to menstruate. 20-22% body fat: This is the “fit” category of the majority of the body fat charts. Also, this level is the most common among female athletes. The women has some definition in the abs and there is a small amount of body fat on the arms and the legs, but it isn’t too visible. 25% body fat: This percentage is on the lower end of what is average for women. At this level, you are neither too slim or overweight. ABs and other muscles are not as apparent at this level, and there is generally more fat around the hips and buttocks areas. 30% body fat: The pictures at the 25% and 30% level don’t show too much of a difference, however at this level there is more accumulation of fat in the hips and buttocks region. 30% body fat is considered a high average for women. 35% body fat: According to the chart from ACE, this level is considered overweight. The body has more fat accumulations and the face and neck begin to appear fuller and more round. Belly fat is also more pronounced at this level as well. 40% body fat: At this level a women is considered obese. This means there is not a very balanced muscle to fat ratio. Some women may not look like they have 40% body fat, but their muscle mass is lower, which brings their percentage to 40%. 45% body fat: At this body weight, the hips become noticeably wider than the shoulders. The general hip circumference may reach 45+ inches and waist circumference 35+ inches. The skin may start to lose its smooth nature at this percentage level. 50% body fat: This skin will appear more dimple or “cottage cheese” like. HIp Circumference may reach 45+ inches and waist circumference 40+ inches. Eating healthy and eating within a calorie limit is important when trying to maintain a certain body fat percentage. Also, resistance exercises and cardiovascular exercises are important in maintaining or achieving a good body fat percentage, according to ACE. To get an accurate measurement of your body fat and track your progress, set up a Body Scan appointment today.